With the release of the NES Mini, a lot of attention is being pushed toward retro systems! Released in 1996, and the first 64 bit gaming console to hit the market, the Nintendo 64 was generally the first major Nintendo console for Millennials. While there is an awesome catalog releases, we have listed our five favorites below! If you don’t have a N64 then you can pick many of these on modern Virtual Console’s or pick up an N64 on Amazon or eBay. “Perfect Dark” brings back a lot of great memories. As a young child, I wasn’t allowed to play shooting games in which the targets were humans. At seven years old, I was playing “Duke Nukem 3D”. While it was pretty violent, the main enemies weren’t humans. I guess my parents were trying to instill some decent values on me; I think it worked. 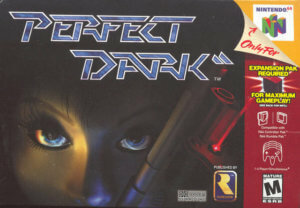 Digression aside, “Perfect Dark” was Rare’s follow up to their massively popular first person shooter “Goldeneye: 007”. Instead of following a gentlemen spy, the story revolved around Joanna Dark, a strong female secret agent with tons of sweet gadgets. The game contained both an excellent single player campaign with varying difficulties and secondary objectives, as well as an addictive multiplayer option. While “Goldeneye: 007” is widely considered the “college game” (meaning that most college kids would gather around “Goldeneye” for competitive play rather than others), “Perfect Dark” still got more competitive play from my friends and I. While Rare has tried to reboot the series with attempts such as the Xbox 360’s “Perfect Dark: Zero”, Joanna Dark has never really been as great as she was in the N64 original. If you’ve never gotten the chance to spend a mission in Joanna’s boots, I highly suggest checking it out. It’s been released on on Xbox One in “Rare Replay”, so modern gamers can check it out for a budget price. It’s the game that started the legacy that we have today. While the original “Super Smash Brothers” may not have as many characters or features as modern entries, the original cemented the overall style of the entire franchise. Not much has changed since the original, you’re still fundamentally playing the same game. You fight a bunch of friends (or engage in great single player content) in crazy arenas all while battling as fan favorite Nintendo characters. While the newer games feature heavy roster padding from the series “Fire Emblem”, the original Smash had a great variety of characters from a bunch of series. Nintendo staples like Link, Zelda, Mario, and Luigi all make appearances, while lesser known characters like Captain Falcon and Ness get great representation well. The game is both a party game and a fighting game, opting for less technical combat systems for more chaotic play. Items play a big part of the original “Super Smash Brothers”, changing the entire tide of battle with a single Pokeball throw. The whole tone of the game is gleeful and hectic, a sort of joyful chaos that only Super Smash can provide. It’s a unique formula that has produced similar games over the years (notably “Playstation All-Stars” for Playstation 3), but nothing will ever come close to the magic of “Super Smash Brothers”. While “Super Smash Brothers: Melee” for the GameCube might’ve perfected the series, the N64 Smash was where all the ground work was laid. As the middle child of a group of three brothers, I was often designated as “player two” on a lot of gaming sessions. For that reason, my brothers and I found cooperative and multiplayer games to be the most satisfying. Enter “Mario Party”, a hybrid of video game madness and board game faux-strategy. This game was a huge hit with kids from all around the neighborhood when I called for a gaming session. Even kids who weren’t into Nintendo found fun within the delightfully colorful game. “Mario Party” has a simple formula. You and three friends (or AI controlled bots) play a certain amount of rounds of the game. Each round consists of players rolling a six sided dice, moving to their appropriate spot on the virtual board, and gaining or losing coins. There’s often “board” unique gameplay scenarios, as “Mario Party” has a collection of “levels” with different themes. There’s a Donkey Kong themed board, a Bowser board, and so forth. After dealing with the outcome of moving your character and the space you’ve landed on, all four people engage in a mini-game. These mini-games range from free-for-all to two-vs-two battles, and there’s a ton of variety. Players use coins from winning mini-games to collect valuable stars, often to be stolen away by other players later. “Mario Party” is known as the proverbial friendship ruiner, and I can attest to this. I remember being upset with my friends several times as they stole away a star from me and snatched victory from under my nose. It’s a decidedly slower game than most Nintendo franchises too, which helps players feel invested in their collection of coins and stars. With the excellent Mini-Game Island mode, players can enjoy all of the mini-games in a play style that represents original Mario. Moving from space to space on an over-world map, players will attempt to beat all the mini-games available with a set amount of tries. It’s a great tool that allows you to practice mini-games for competitive games, all while enjoying the progression that standard Mario title allow. 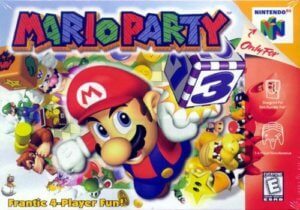 With over ten sequels in the series, it’s pretty obvious how popular “Mario Party” has become. Most readers will notice that at #2 I have “Banjo Kazooie”, and not “Super Mario 64”. This is a controversial opinion, as an overwhelming amount of Nintendo fans and gamers in general regard Mario 64 as the best platformer on N64. While I believe that “Super Mario 64” is one of the pinnacles of 3D platforming EVER, “Banjo Kazooie” is just more my style. Both games play similarly; you navigate a 3D hub world with smaller levels within, picking up items to unlock further levels. In “Super Mario 64”, you play as Mario, collecting coins and stars. “Banjo Kazooie” sees you controlling a duo comprised of a bear and bird, collecting music notes and jigsaw puzzles pieces. “Banjo Kazooie” also pushes the idea of complete level theming further than Mario 64, ensuring that most of (if not all) of the level ties into the theme. For instance, the pirate themed level sees you collecting treasure in a sunken ship, fighting a giant crab, shooting cannons, and dodging hungry sharks. While Mario 64 has thematic objectives, Banjo really does a great job of making the player immersed in each level. While I’ve played both games just as much as the other, Banjo sticks out due to its unique style and tone. There’s an overall humor to “Banjo Kazooie” (and its sequels) that I can compare more to “Conker’s Bad Fur Day” than Mario 64. Characters are obnoxious and loud, all while being endearing and entertaining. Mario 64 feels a bit limited in that regard, as it’s trying to adhere to an overall brand image. In general, Banjo takes a lot more risks. For instance, one of the later levels in Banjo revolves around the same area four times. The gimmick here is that each version of the area takes place in a different season. The theme of season change is done so well here, that you truly feel like you’re playing a completely different level, despite the main structure staying the same. Most levels play off the great amount of unlockable moves and abilities that the duo can learn. From shooting eggs out your rear to dive bombing, Banjo and Kazooie work together to perform some crazy fun moves. It provides for unique and experimental platforming that never feels awkward. The game has a great amount of heart and character to it, and I wouldn’t change a thing. Okay, let me just nerd out real quick. Ocarina of Time is so good, guys. I know you’ve heard it a million times before and you’ll hear it a million times after reading it here, but it’s true. Whether it’s your least favorite or definite favorite Zelda game, it’s hard to deny that Ocarina of Time does something special. A lot of what I said about “Banjo Kazooie” regarding its handle on thematic gameplay can be said for Ocarina of Time. It’s hard to truly encompass what makes OoT so great, and maybe that’s why it’s so good. There’s a combination of nostalgia, gameplay bliss, and immersion I get when I find myself in the great land of Hyrule. Few games have ever been able to replicate it, and I find no game more synonymous with my childhood love for the Nintendo 64 than this one. I’m a sucker for thematic game-play, it’s blatantly obvious. I can partially thank Ocarina for that, as the entire structure of the temples are built around single thematic elements. While “Super Mario Brothers 3” and many other games did it far before Ocarina of Time, the use of elements as themes really shines in the Zelda package. The forest, fire, water, shadow, and spirit temples all resemble the images the themes provoke. The game-play is tied into these themes, with Link needing to acquire more powerful items to tackle challenges. A fire tunic is needed to withstand the heat of the Fire Temple, a mystical artifact is needed to explore the Shadow Temple, and so forth. Combine this with the absolute perfection of level design (with the exception of the Water Temple, perhaps), and you have a great set of areas to explore. The game has a timeless narrative of the underdog saving the world, and it works great here. As a player, it’s easy to identify with Link (only his name by canon, you can name your character anything you want). We experience his childhood through some great introductory game-play and world building. In fact, the “child dungeons” (three shorter temples) in the beginning of the game are my favorite of the bunch. 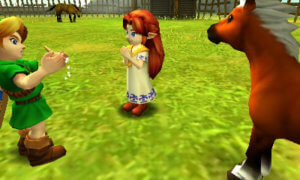 As the story progresses, Link meets characters and forms relationships that span across his time in Hyrule, making the story intimate despite its relatively large size (for the time). In general, “The Legend of Zelda: Ocarina of Time” stands a testament to good game design. There’s no singular gimmicky feature in Ocarina of Time. Sure, you can change between an adult Link and child Link at any given time after a certain story point, but the overall game-play arc is fundamental. By perfecting swordplay, puzzles, and exploration, Nintendo crafted one of the best (if not the best) games of all time. It’s a treat to play, and with the 3D remake on Nintendo 3DS, there’s no excuse to avoid playing it if you’ve never tried it. It’s truly a remarkable game that blurs the lines of RPG and action adventure and comes out representing something better than the sum of its parts.